We will discuss frequency inverters with several pumping application examples. Although there are many uses for frequency inverters in the pumping environment, they usually fall into three basic categories -- constant pressure, constant flow, and variable flow. There are, of course, other ways to maintain these conditions (control valves for example) but the frequency inverter offers an extra bonus -- a significant reduction in power consumption. Constant pressure applications include those where pressure is maintained at some desired point regardless of flow. Domestic and commercial booster systems are a good example and usually employ a pressure transducer that controls the output frequency of the frequency inverter which, in turn, changes pump speed in order to keep pressure constant. The illustration at the top of the following page shows a simplex booster in a constant pressure application. The 60 HZ design point is 150 GPM @ 120' TDH and requires 6.4 BHP. The two other curves represent 55 and 50 Hz operation. The red horizontal line indicates the constant pressure required at various flow rates. 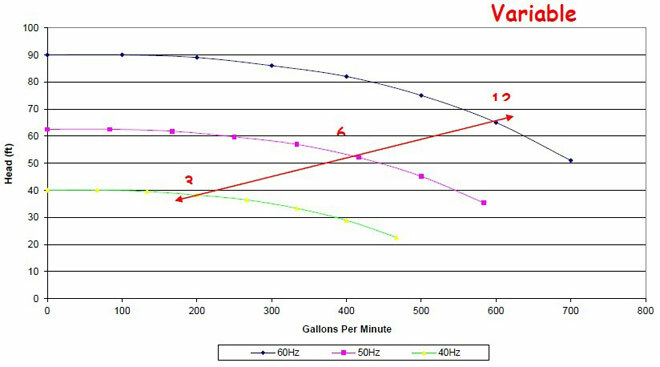 At about 53 Hz the pump can provide 100 gpm at the design head and at 50 Hz it can provide about 50 gpm. Therefore over a relatively small frequency range of 50 to 60 Hz the pump will provide 50 to 150 gpm at 120'. Remember that the frequency inverter produces not only 50, 55, and 60 Hz pulses, but also each individual (and fractional) Hz in between. The result is a significant savings in the power required at flows lower than design flow. 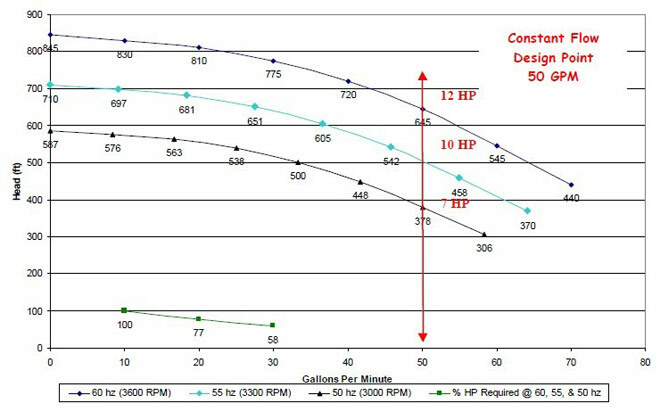 The brake BHP requirement at 53 Hz (100 gpm) drops to 3.7 or 58% of design point HP. And, at 50 Hz (50 gpm) it drops to 2.5 HP or just 39% of that at the design point . Now, we could use a pressure reducing valve (PRV) to maintain a constant pressure of 120 feet as demand decreases and take advantage of the centrifugal pump's reduced power consumption as its flow moves towards the left of the capacity curve. 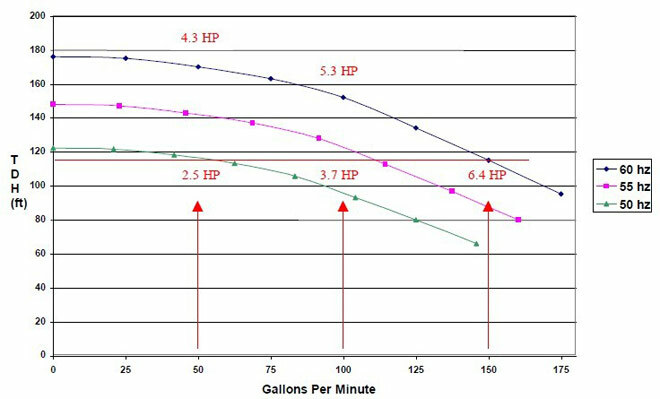 But, at the 100 gpm point on the 60 Hz curve the required BHP is 5.3. Even though flow is reduced, the power required by a PRV application is 5.3 HP compared to 3.7 HP for frequency inverter control. At 50 gpm PRV control requires 4.3 HP or 72% more than the frequency inverter. In a constant pressure application, the frequency inverter offers precise and flexible control plus an increased power savings over mechanical constant pressure devices. Because centrifugal pumps follow the laws of affinity, a relatively small change in frequency (speed) can result in a substantial reduction in power. The illustration at the top of the following page is that of a Constant flow application. These applications require flow to remain constant regardless of the back pressure the system may encounter. A flow meter is usually employed to control frequency inverter output and, in turn, motor speed. Examples include maintaining levels in tanks at various elevations, manufacturing processes, and the operation of nearby and remote irrigation zones. Each of the multiple components served by these applications require similar flows but, differences in elevation, back pressure, and pipe line friction may require different pressures to maintain those flows. The system is designed for the highest pressure component of the application so that the frequency inverter can reduce motor speed for the lower pressure component and save energy in doing so. Variable Flow applications might also be termed variable flow / variable pressure because neither remains constant. Most are circulation applications and deal only with pipe line friction as flow changes. A major application area is that of chilled water circulation in large air conditioning systems (HVAC) where cooling demand is always changing. Since the chilled water flows in a circulation loop, the only pressure component that changes is that due the friction caused by the flowing water. frequency inverter output is controlled by a flow meter, temperature transmitter, or directly by the chiller controls. The cooling tower pump is often controlled by the same circuit. The illustration at the top of the following page is that of a variable flow, chilled water application. The diagonal arrow shows flow points on the various frequency curves and the additional pressure required to over come friction as flow increases. Please note that the arrow may not necessarily be a straight line. Since friction is not a linear function, it could be curved and would be based upon the calculated friction in the circulation loop. In the past, multi-speed motors were used for this application. Large swimming pools also use a similar design for circulation through a filter. Again, power savings is achieved as the flow is decreased by the frequency inverter. A final advantage, available to any frequency inverter application, is the Soft Start/Stop option. This option allows the pump and motor to be started at a lower frequency (say 30 HZ) and then "ramped" up to run speed over a period of a second or more. The result is a significant reduction in the starting current required by the motor. Some utilities require that motors over a certain HP undergo a soft start. With the frequency inverter, its just part of the package. In addition to a lower inrush current, mechanical stress on the motor and pump are also greatly reduced. In a normal "across the line" start, the motor rotor and pump rotating element go from motionless to the motor's rated RPM in about one second! And, soft start/stop virtually eliminates water hammer in almost any pumping system.